1 edition of swirling emptiness found in the catalog. Add another edition? Are you sure you want to remove swirling emptiness from your list? The catalogue accompanies the exhibition Swirling Emptiness 27th April – 28th July 2013. 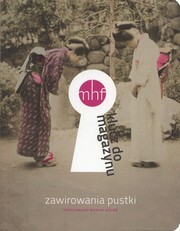 Honorary Patronage of the exhibition was assumed by the Ambassador of Japan to Poland, Mr. Makoto Yamanaka. Honorary Patronage of the project The key to the Storeroom was assumed by the Mayor of the City of Krakow, Professor Jacek Majchrowski, and the Marshal of Małopolska Region, Mr. Marek Sowa. We would like to thank Professor Alfred F. Majewicz, Beata Romanowicz and Miho Iwata for their content-related support in the preparation of this publication.